Got an idea for an app? Great! Nearly everyone has a smart phone in their pocket these days, so why not try to fill a small part of their home page. A lot of businesses have thrived on app development, providing some of the most innovative ideas of the 21st century. If you’ve been completely oblivious up until this point in your life about what happens behind the scenes of mobile applications, let me be the first to tell you – there is a fair bit to catch up on. Don’t let this scare you off, that’s what this articles is here for! Throughout, we will hopefully answer some of those burning questions you may have about app development. I figure if you’ve made it to this page, you’re probably seeking more information about the relevance of apps, and whether or not you need one. For most small businesses, the demand and pressure to keep up with big boys is intense, so it is only right you’re feeling this way. However, if you’re looking to transfer the same information from your website to an app, the data may be redundant. Does your website scale down to your mobile? If so, then having an app developed is likely to be a pointless exercise and a waste of resources. If not, then possibly spend that extra money you had on making the website scaleable. If this is you, I applaud you on your creativity… coming up with new and innovative idea these days is not an easy ride. I know the feeling of having an amazing thought, and immediately then and there wanting the app available to you – impatience can be annoying, and the unfortunate news is that app development takes an extremely loooooooooooooong time. There are a lot (I mean a lot) of processes to be processed and decisions to be decided, and jumping in guns blazing often will not yield anything valuable. Take the time to let the idea stew. I mean, I’m sure in the few weeks it takes you to start acting no one is going to beat you to the punch line, unless you start broadcasting it to the world. Okay I’m ready, where do I start? Get a pencil out and start drawing. If you’ve forgotten what a pencil is, it’s this wooden stick thing that old people use. Unless you’ve got one of those fancy graphic design tablets, it is still by far the best way to get your ideas down. This is where you should start designing the wireframe of the app. If you don’t know what a wireframe is, it is visually stripping down the app showing purely the functionality of it. The developer needs to understand to the full extent the ideas you are trying to convey – fail to do this can lead to disappointment and wasted resources. 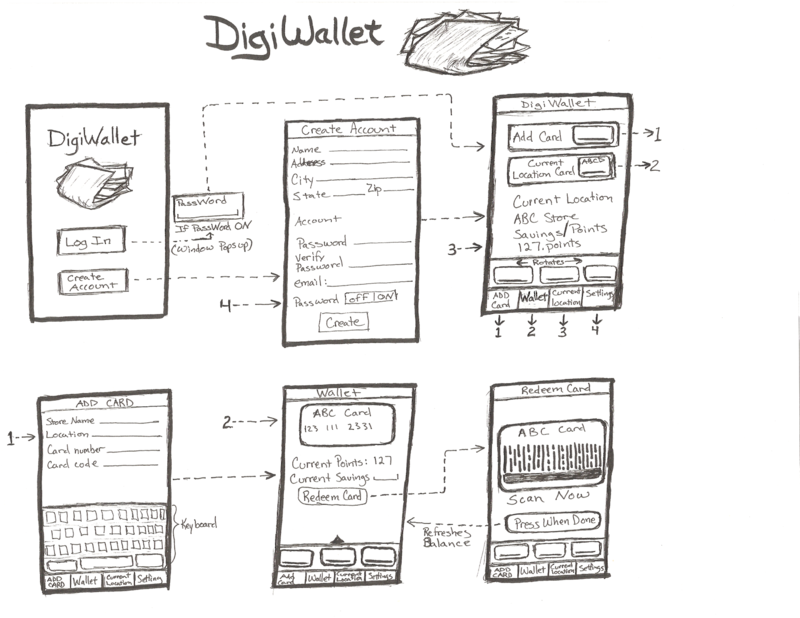 This is a typical drawing of an application wireframe. If drawing simply isn’t your thing, there are plenty of web apps that can assist you. Here are some great tools. Once you’ve got your drawings down, it is now time to explain what everything does, and why it does it. Begin to write up your application brief. If you don’t know where to start, simply begin by writing about how you would explain the app to a friend. If you want to make it easier to read, try adding comments or notes to the wireframe linking back to the brief, and be specific about your budget, time constraints and what platforms you would like the app to run on (i.e. native to iOS, or for android as well). If you’re planning on going to an app developer – like we said before you’re going to need it to be as specific as possible. It is beyond easy for others to misinterpret your ideas, and even easier to forget what has been said and what is still in your mind. The next question is how big is your budget? If you’ve got 50k to spend on this this thing, have a look locally – it is always great to support local business. If you’re budget is slightly smaller than that (10-25k), maybe have a look at some of the Eastern European countries. An advantage of using these companies is that English is usually taught as a second language in those countries and given that getting the app perfect is mainly about communication, this is vital. And finally, although English is still of high standard, if your budget is at a bare minimum (<5k), Asian countries are your next best option. This was information extracted from mobiversal.com which we found to be relatively accurate. We also found after receiving a few quotes, most development companies will usually require around 300 hours to create a small application. This included backend and frontend development, testing as well as launch. There is also one off costs like setting up business accounts with iTunes which is about $300. Where can I find a developer? We really liked using the website AppFutura.com. Not only does it provide huge listings of development companies all over the World, it also has a review system and provides basic info in the search listings about the typical prices they charge. What we liked best about the site was the option to post your own proposal. Once we posted our job up and budget outline, we were inundated with response. Once you weaned the spam, and those not specific, you should be at least left with a few companies. The next thing to do before contacting them is to check their site. Having a browse of their portfolio is a must as it generally shows the quality of their work. However, don’t be fooled – this is their best work so if this stuff doesn’t look amazing to you, you can be damn sure you won’t be amazed by what they make for you. If you like what you see, or if there is a particular app that they have developed in the past that aligns with your idea – this is a good starting point to ask them for a quote. After you receive your first proposal, this is not final. I know this will be fairly obvious to businessmen like yourselves, but it is good to ensure that you keep costs to a minimum. After I received a proposal of $4300usd, I managed to get them down to $3000usd just by saying it was over budget. And some further negotiation I was able to have the app built with the support of updates and maintenance for up to a year for just $2500usd. Make sure you pay in installments. That way you can track progress of development and have more control over the project. If a company receives the payment in full, they are less likely to give you as much attention. Have your developers easy to reach. I used Skype to keep in close contact during the whole process as they were online for at least 10 business hours of the day. The truth is that there are hundreds, if not thousands of development companies out there all battling it out for your custom – so don’t feel tied down after being given a quote tailored specifically to you. Take your time and really do your research. There are millions of apps out there, make sure yours counts.